The country was the first to eliminate HIV transmission from mother to child. Despite being an island largely cut off from much of the world due to a decades-long embargo, Cuba has managed to build a robust health system that has been credited with some major medical advancements in recent years. A 2012 study published in the American Journal of Public Health found that despite the country's limited resources, it had created a system that many other countries, including a few developed countries, might envy. "Few can match Cuba’s record of 98 percent full immunization by the age of 2 years, vaccinating children against 13 illnesses; antenatal care for 95 percent of pregnant women by the end of their first trimester with rates of infant mortality less than 5 per 1000 births; and chronic disease control, including at least yearly blood pressure measurements for almost the entire population," the study authors wrote. In 2015, the World Health Organization recognized Cuba as the first country to eliminate HIV transmission from mother to child. The WHO and the Pan American Health Organization had been working with Cuba since 2010 to improve "access to prenatal care, HIV and syphilis testing for both pregnant women and their partners, treatment for women who test positive and their babies, cesarean deliveries and substitution of breastfeeding,"
Dr. C. William Keck, the former director of health for the City of Akron and lead author of the 2012 study, pointed out that though the government has limited resources, a relentless focus on preventative care has helped improve health outcomes for many in the country. "With a few exceptions, it's somewhere around 99 plus percent, [Cubans] are seen at least once a year and probably twice [by their doctor]," said Keck. Cuba's infant mortality rate has dramatically lowered to less than 5 per 1,000 births, according to the 2012 study. That is just under the 2014 rate in the U.S. of 5.82 deaths per 1,000 live births, according to the U.S. Centers for Disease Control and Prevention. In part, the improved outcomes came as Cuba increasingly focused on preventive care according to Keck. He explained that in the mid-1980s, the Cuban government decided to focus on preventative care to keep the residents healthy and started a program to get every Cuban easily accessible health care. "They were able to put together a preventative-oriented primary care system that reaches every Cuban," Keck explained. "Every Cuban has access to a physician and nurse team." Keck said doctors and nurses often visit patients at home and are responsible for whole communities so that they can better understand the health problems and risks their patients face. 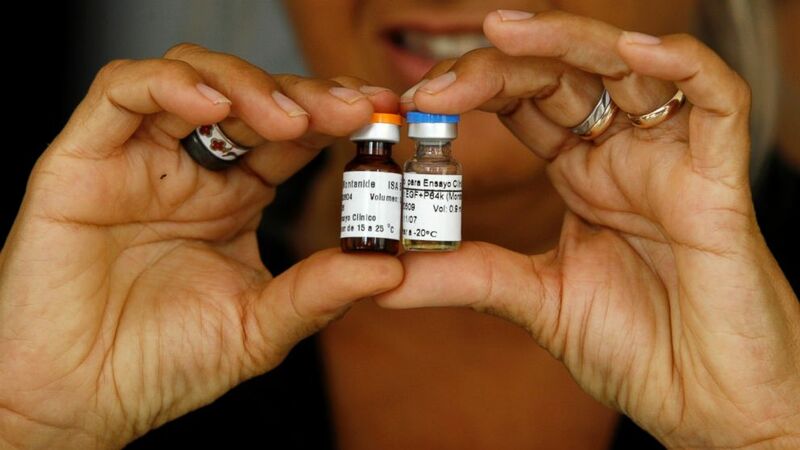 (Javier Galeano/AP Photo) A Cuban health officer presents CimaVax EGF, medicine used in the treatment of advanced lung cancer, in Havana, June 24, 2008. One byproduct of the improved relations between the U.S. and Cuba is the exchange of needed medications. Last year, the Roswell Park Cancer Institute in Buffalo, New York, started work to bring an innovative lung cancer vaccine called "Cimavax" to the U.S. The drug was developed by Cuba's Center for Molecular Immunology and is currently has been approved for a phase I safety and efficacy testing in the U.S. by the FDA. In a Cuba-based trial with 405 total lung cancer patients, those who were given the drug lived on average about three months longer than those who didn't. Keck said the embargo likely helped spur development as the island was cut off from American-owned medical suppliers. "The problems continued to worsen to Cuba [in recent years]," Keck said. "They made this huge investment in biotech and now Cuba has 24 research institutions and 58 manufacturing facilities." Since the government controls all development in the communist country, it has more latitude to put resources in medications without worrying as much about profitability, according to Keck. "This closed-loop approach is one that asks, 'What are our major public health problems and what can we do with the limited resources to address them?'" said Keck. Dr. Nina Suresh is a resident physician in pediatrics at New York- Presbyterian Weill Cornell Medical Center. She is a resident in the ABC News Medical Unit.